The Ultimate Guide to Measuring gives you all the tips, tricks, and info you need to make everything you bake turn out wonderful with accurate measuring. The most foolproof path to baking success is to measure accurately. I get dozens of comments every week asking why a baking recipe didn’t turn out properly, and I’d say half the time it’s likely due to inaccurate measuring. Baking is a science where precision is rewarded in perfectly delicious treats. I’ve laid out ALL the tips, tricks, and methods you need to know to measure accurately so everything you bake will be delightful. I hope you find it helpful! 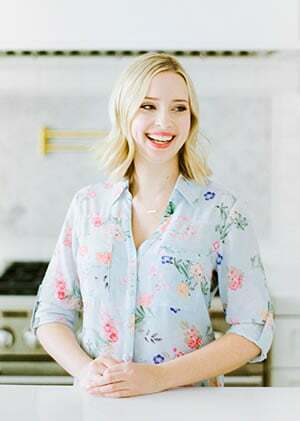 If you like this guide, don’t forget to sign up for my emails to get more baking recipes and tricks (you’ll also get a free Favorite Desserts cookbook). The most accurate way to measure is by weight, so I HIGHLY suggest you invest in a digital food scale if you don’t already have one. It’s a small investment to ensure baking success, especially because baking ingredients can get pretty pricey. Weighing your ingredients is easy, fast, and clean. Plus, it’s how the pros do it. I’ve been using this Escali scale for years with absolutely no issues. I’ve also used and enjoyed this OXO Scale. Everything just goes directly into the bowl, no measuring cups to clean! To use a digital kitchen scale, place your mixing bowl on the scale. Press the “zero” or “tare” button to take away the weight of the bowl. Add your ingredients until you achieve the weight called for in the recipe. You may need to give or take a few tablespoons to land directly on that number. Hit the tare button again to reset the weight to 0 before moving on to the next ingredient. It’s that easy! 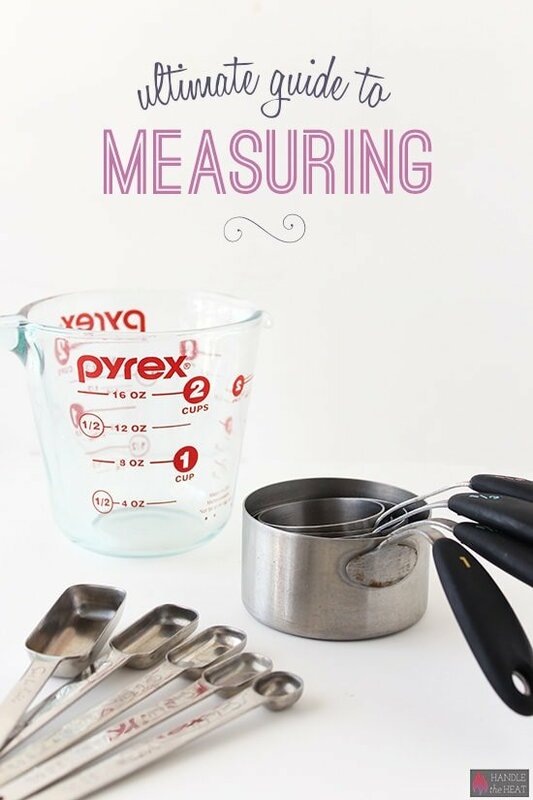 If you don’t have a scale and don’t plan on using one, I’ve also included tips for measuring by volume with dry and liquid measuring cups below. There’s also a breakdown of volume to weight measurement conversions that will come in handy when you’re in the kitchen. Please note that different ingredients have different densities, meaning 1 cup of every ingredient will not weigh the same. Think about it, 1 cup of feathers would not weigh the same as 1 cup of lead, right? Same goes for baking and cooking. Also note that some brands of the same product can have slightly different weights. If you are following a recipe from a baking cookbook, follow the ingredient weights provided either in the ingredient list or in a conversion appendix in the book. The general rule is if you can pour it, use a liquid measuring cup (oil, honey, maple syrup, etc.). If you can smooth the top, use a dry measuring cup (peanut butter, sour cream, etc.). Always measure at eye-level with liquid measuring cups. Always fill dry measuring cups to the brim then scrape off any excess. Make sure to use quality measuring cups and spoons, they do make a difference! I like these measuring spoons because they fit wonderfully inside small jars and these stainless steal dry measuring cups because they’re super durable. Also, avoid 2-cup dry measurements because they tend to compact the food, giving you an inaccurate measurement. Most any liquid measuring cup should work just fine. This is arguably the most important ingredient to accurately measure. A mis-measured cup of flour can ruin your baking project. Unfortunately, flour can be very difficult to measure by volume (using measuring cups). Scooping your measuring cup directly into your container of flour to measure can pack the flour in, causing your measurement to be much more dense. In fact, this method of scooping can lead a cup of flour to weigh almost 2 ounces more than the spoon and level method! This can make a HUGE difference in the composition of your baked goods. If you’ve ever had cookies not spread in the oven or turn crumbly or heavy or had homemade bread turn out dense, those are just two examples of what too much flour can do in baking. Fluff up your container of flour. Spoon the flour into your measuring cup, then scrape off the excess with a straight edge. A flour scoop is the best tool for this. This will get you about 4.5 ounces or 127 grams of all-purpose flour per cup. 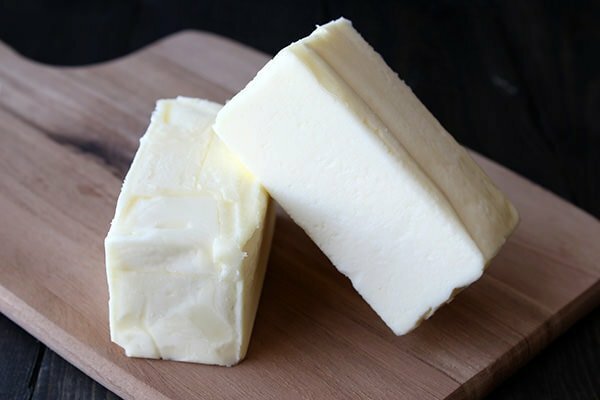 There are SO many methods of measurement used for butter in recipes and I know it can be absolutely confusing. I try to call for both sticks and at least one other measurement, tablespoons if it’s a small amount, and ounces if it’s a larger amount. I know this is still confusing if you aren’t in America, so here is a super useful equivalent for butter measurements you may want to put into your phone or print out for your kitchen. Shake up the container of leavener slightly then use a measuring spoon to lightly scoop a mound. Use a flat edge to scrape off the excess. ALWAYS use fresh baking powder and baking soda. Toss anything older than 6 months. Sometimes baking soda and baking powder can expire before the stamped expiration date. Baking Soda: Place 1/4 teaspoon in a bowl and pour 1 teaspoon distilled vinegar on top. If it bubbles up, it is fresh. If nothing happens, throw away. Baking powder: Place 1 teaspoon in a bowl with 1 cup hot tap water. If it bubbles up, it is fresh. If nothing happens, throw away. Measure like baking powder or baking soda. In a liquid measuring cup combine 1 teaspoon of granulated sugar with 1/2 cup of lukewarm water (110 to 115°F). Add in one package, or 2 1/4 teaspoons, of active dry yeast and stir until there are no more yeast granules floating on top of the water. Within five minutes, the yeast should have absorbed enough water to activate. After ten minutes the yeast mixture should be very foamy and have risen to at least the 1-cup measurement. If your yeast did not rise to the 1-cup mark, it should be discarded. Measuring granulated sugar is a little more simple than flour. Use your measuring cup as a scoop to dip into the container then use a flat edge to scrape off any excess. Pay attention to the measurement direction written in the recipe, it will usually say “brown sugar, lightly packed.” This is basically the opposite of flour measuring and means you pack the brown sugar into the measuring cup until it reaches the brim. Make sure to break any large clumps before measuring. Also called confectioners’ sugar, this stuff can make a huge mess when measuring. Spoon the sugar into your measuring cup then use a straight edge to scrape off any excess. It also often needs to be sifted before being adding to recipes since it is usually lumpy. Spoon the cocoa powder into the measuring cup then scrape off the excess with a straight edge. As with powdered sugar above, make sure to sift before or after measuring as instructed by the recipe. Sifting cocoa powder is always a good idea because it is naturally very lumpy. If a recipe calls for oil and a liquid sweetener, measure the oil first to grease the measuring cup. You can also spray nonstick cooking spray inside the measuring cup before measuring sticky ingredients. I agree with Taylor – you post the best ultimate guides. They’re super helpful and this one is no exception! Thank you so much for sharing Tessa! I’m gonna print and laminate this to leave it in my kitchen! Thanks, Tessa! It’s really helpful! Thanks so much for this!! I prefer using my kitchen scale rather than measuring cups (which you don’t use at all in my country, bought them when being on a holiday in the UK, ust so that I will be able to try out English-speaking recipes), this makes life so much easier for me!! Great tips! I couldn’t do without my scale! Hi, I have a question about using a kitchen scale. If you put the ingredients in a bowl on the kitchen scale, do you subtract the weight of the bowl when measuring the ingredients from the total weight that shows up? Sorry I realize this is very confusing but I was thinking of buying a scale. Thank you for these tips! I can’t believe I missed that…thanks again! Your information has been very helpful! Haha isn’t it strange!? I don’t know why it’s so unpopular in the US. I’m so glad the conversions are helpful! thanks a lot, a really love this ! now I can finally try recipes that are written in English. That’s a great idea. I’ll get to work on that and add it into this post! THANK YOU SO MUCH for this post, Tessa! ps. I just love your blog/YT channel, it’s my addiction!!! Should you sift the flour before measuring. It always looks like too much flour if I don’t sift it? When it comes to sifting it’s important to sift in the order the recipe calls for. For example “1 cup flour, sifter” means you measure out the flour first then sift it to use in the recipe. I hope that helps, and I hope you make the brownie recipe! I’ll add that to the list – thanks for the suggestion! Adore your ideas and tips! Hi Tessa, is the amount of cocoa powder in a cup, as specified above, before or after sifting? You said: 1 cup cocoa powder = 3.5 ounces = 100 grams…. But it said 1 US cup of cocoa powder is 118g….which doesn’t match your conversion…help! Tessa I could just faint with relief!! I’ve been trying to learn baking and am demoralised that no matter how carefully I follow the recipe it doesn’t work. With your tips and tricks, I’m hoping to be able to become more intuitive about whether my dough/better is the right consistency, and if my cakes a mutent, why that might be. Great post- wish you had it in a PDF without the pictures…. Or should I start copy/pasting away and make one- because I need to add this to the front of my kitchen binder asap! Some I knew and someI was surprised. Good work . I need to get a digital scale for my kitchen! Ever since I first used a scale in my science class I have wanted one for my baking. Like you said, cooking is a science, and therefore you want it to be accurate to get the same results every time. The only way to do this is probably a kitchen scale. However, I have just never put it in my budget. So, I really appreciate your other measuring tips, especially about flour. I’ll have to use them until I get my scale. Hi tessa! Is this mean, if it required me to measured 1 cup of milk, i HAVE to use the liquid measurement cup? .. does the quantity become different if i use 1cup of liquid in dry measurement cup? Yes, liquids should be measured in a liquid measuring cup. You’ll always end up with less in a dry measuring cup simply because you can’t perfectly level it off without it overflowing. Thank you so very much Tessa for all your free advice, just want you to know it is very well appreciated. I used to live in Trinidad and Tobago and my mom used the scale all the time in the kitchen, it was the only way I knew how to bake accurately, however since moving to the US I confusingly adapted my mother in law way of baking and now reading your post I am amazed that people still do used a scale. My question to you is, when a recipe calls for measurements in cups, should I weigh the ingredients instead? And how would I know what 1cup etc should weigh on the scale? Hi – I’ve noticed several of your conversions are slightly different than other sources on the internet. I know in one of the previous comments about the cocoa powder you said it may vary based on the brand. How do we test our brands to ensure we are using the accurate measurement? Use the nutrition label weight measurement. It should say what the serving size is and what the ounce or gram weight of that size is. That can be your base calculation to figure out what the recipe calls for. Hope that makes sense! I don’t have a website. I am a beginner in baking. I have a question. Is all purpose flour the same as “plain” flour. Is cake flour the same as plain flour. I am confused with flours. Could you please help me. Thank you. hi there’s no mention of self raising flour? or margerine? Tessa, I watch food shows and Alton Brown also suggests weighing dry ingredients. I have begun to do this since I started making bread. I found that my measuring cup was quite a bit more than the 127 grams when weighing flour. Could it be that my measuring cups need to be replaced? I see that you shared your choice with us. Are they more accurate when measuring then weighing dry ingredients? Thanks! You have provided so much information that would have cost quite a bit of money by buying baking books that don’t always provide as much information as your time consuming efforts has provided to this baking community. Your detailed information is so simple and easy to follow and understand. Thanks so much, Peter! That makes me very happy to hear. Tessa, Do you have a printable or PDF version available? Print doesn’t seem to be working. This is the BEST post ever!!!!!!!! !